Throw your hair up in a ponytail and hit the field with the Atta Girl Baseball/Softball Cap! This fully lined cap features an adjustable back hook-and-loop closure and an opening to accommodate the kinds of hairstyles an active gal needs when she's ready to play ball. Topstitching detail inside and out adds to the realism, while the lightweight foam brim is flexible and play-friendly. 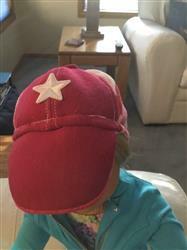 This cap is part of the complete Atta Girl Baseball/Softball Uniform PDF pattern collection inspired by Mo'ne Davis, a talented young teen who not only took the path less chosen by playing baseball with the boys, but became the first girl to win and pitch a shutout in the Little League World Series in 2014. Other patterns available include a jersey, pants and belt, and the complete all-in-one collection. Cute hat, but peak was a bit off. Overall, I was satisfied with this little baseball hat. I have been so happy with all the patterns from Pixie Faire and although I wasn't unhappy with this one, I did have a few issues. I found the directions to be a little unclear in a few spots and yet in so much detail in other spots - kind of strange. There was a mistake in number 25 I believe it was. I am an experienced sewer so I figured it out. I followed the directions and used the foam in the peak as suggested. The peak points down instead of out as a normal cap would be. I tried to fix it to no avail. 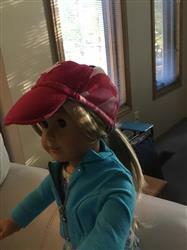 It means it has to be placed fairly far back on the doll's head so that the peak isn't covering her face completely. If I make it again, I think I would cut the size of the peak back a fair bit. Maybe that would help. Or maybe it needed to be wider at the back to help keep it more upright. Still a great pattern but the only one I haven't been totally satisfied with. Pretty easy pattern, however #25 of the instructions is wrong. It says to put wrong sides together and it should be right sides. I forgot this both times I used the pattern and had to rip it out. Atta Girl Baseball cap was a hit with my grand daughter. Easy to follow instructions. Made in black denim with an orange "H" (school colors). Cap fits nicely and is a quality piece!